The Over Time tool requires dates and scores in your data ie. 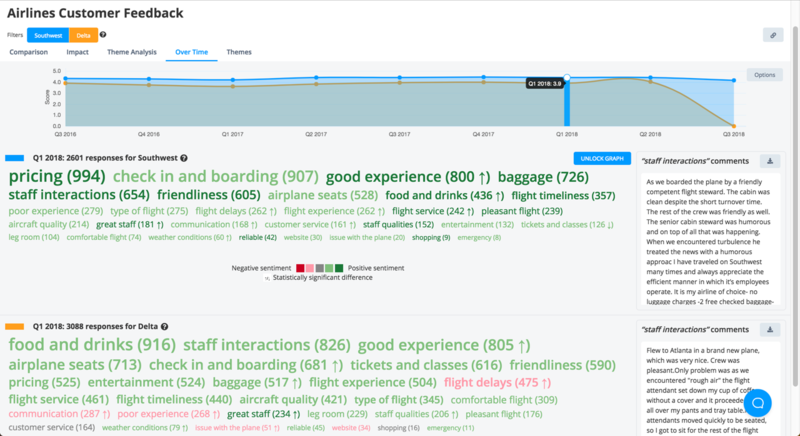 Net Promoter Score (NPS), Customer Satisfaction (CSAT) or 1-5 star ratings. The Over Time analytic tool shows you the change in score and theme volume over different time periods in your data. To see the exact score in a time period, mouse over the dot. To change the time period to weeks, months, quarters or 90 day rolling use the options button. Select a time period by clicking on a time periods dot. The themes word cloud will update, as well as the total number of responses in that time period displayed at the top of the wordcloud. To unselect a time period click the "Unlock graph" button. 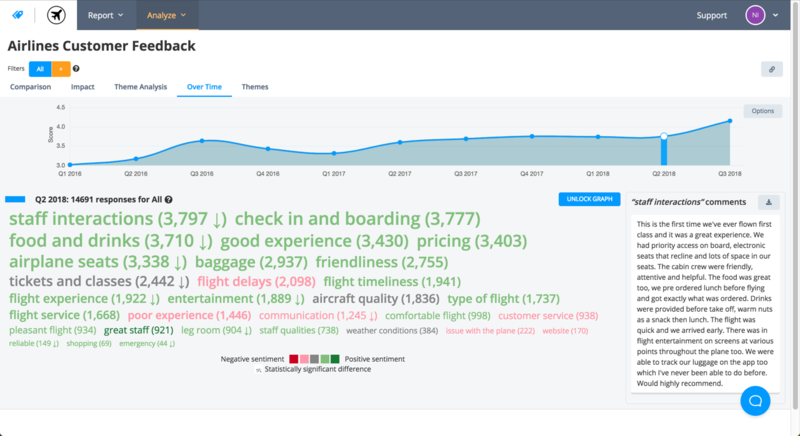 Like the Themes or Sentiment tool, the themes are color-coded to represent their sentiment and themes with a statistically significant increase or decrease in frequency in the time period compared to overall are marked with an up or down arrow. Adding a score filter to over time will only limit the range of scores shown, and any applied date filters will not have any effect. Adding an orange filter will add a new orange scoreline to show the second filtered set of data score. Adding an orange filter will also add another word cloud below the first to show the second filtered set of datas themes.